When I set off for a week away in rural Suffolk last Friday I knew it wasn’t ideal timing to have a week away from erg training in the second week of the new distance training group. However, it has been a long time since I’ve had a full week of rest from the erg, and I convinced myself it would be beneficial. When we arrived at our holiday cottage the information booklet said that there was a gym at a hotel in the village, and they will generally allow day visitors. I was tempted to go and check it out, but a small village hotel was not overly likely to have a C2 (in good condition at least), and it wasn’t convenient to travel to the hotel. So relaxation, reading, and drinking beer were good substitute past times. Not the best photos as I seem to be having trouble resizing them. 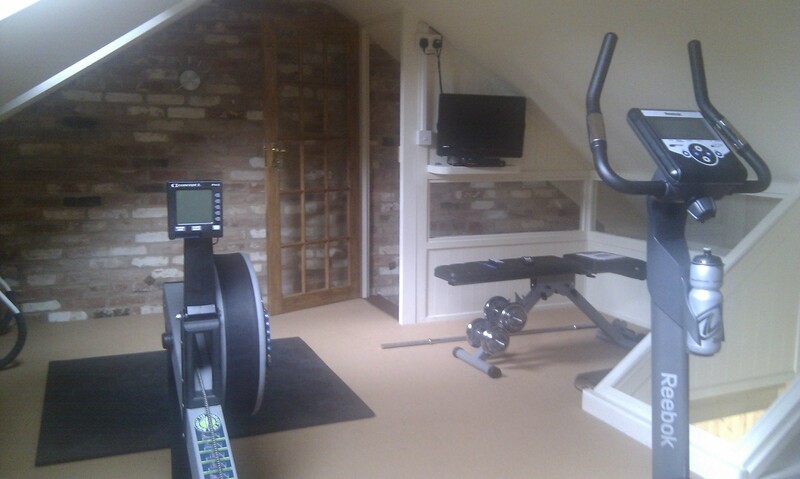 So the owner had just completed work on his gym conversion upstairs in his garage a couple of weeks before, and had a “brand new” reconditioned model C complete with PM3 monitor and model D handle. 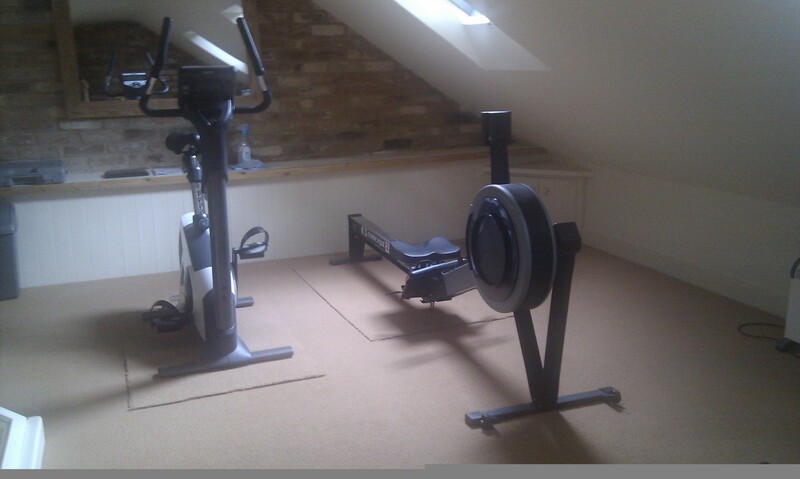 It felt like a brand new erg. With the current training phase aimed at a 60min time trial I wanted a way to put some work in at a faster pace, but without compromising the endurance focus. So today’s session was an alternating paced session with odd reps (1,3,5,7) at a little slower than current 60min pace, and even reps a bit faster than current 10k pace. The session didn’t feel easy, but was at a pace that should be fairly well sub maximal. The easiest way to tell if that was the case was to try to do the last rep a good bit faster. Nearly 6 seconds in pace faster than the next faster reps tells me my targets were a little soft, but that’s ok. One bonus of this type of session is that 1:50 pace really does feel like a recovery through it. I have just started two new Pete Plan training groups this week. Both are 8 week groups and are aimed towards a 60min TT and a 1k TT respectively. I didn’t advertise these groups at all because they were always intended to follow from the previous standard Pete Plan group that has run for the past 8 weeks, and as a choice of stream for the people in that group to follow. I have had some new people join the groups on top of many from the previous group too though. As with all of the training groups I have run they follow a standard format, and come at a standard price. All coached training groups are £20 per 4 week block, so £40 for these 8 week groups, or £60 for 12 week groups. The training week consists of 3 core sessions and 3+ optional lower intensity distance pieces. Targets are set for the core sessions in 2 week blocks throughout the 8 week period, and the athletes in the group are free to share their results with other people in the group to compare progress. A gradual negative split, or increase in pace, during the 30min row felt good. The 250m sprint on the back of it was perhaps a bad idea in terms of recovery for the next hard session today. This session was programmed as a 3 x 20min session with targets of 1:50, 1:49, 1:48. It was a long day at work, and getting fairly late by the time I was midway through the session. The pace wasn’t overly tough, but the duration was a step too far today and I decided to ditch the final rep and go and get something to eat instead! The plan with the recent Pete Plan training group followed by these two streams was to give people a target during the off season over the summer, and get them in good shape to the racing season build up. The British Indoor champs has now been announced as taking place on Sunday 25th March at the University of Nottingham, which will be something like 6 weeks after the worlds in the US. There is then the Irish champs in Dublin, and the Nottinghamshire IRC both taking place on the weekend of 12th November. Therefore the likely coaching plans following these groups will be a 2k focused group up to the Irish / Newark race on 12th November, then probably an extended group (12 weeks) leading up to Boston, with a further 8 week group leading up to the British in March (or following on from Boston for those doing both). My own racing plans will be to race the 2k in Newark, hopefully Boston, and probably the British. For anyone considering those three races, if you want to join a training group leading up to them I will advertise them about a month before they start, and will likely limit numbers to keep them manageable. There are a few other regional races trying to get off the ground this winter, so try to support those if you are able – a lot of work goes into organising a venue race, so if you don’t support them they won’t happen again. So for today I will just summarise. That sets the scene of the past few days, still just steady distance work in general. We are 1 week away from the start of the next Pete Plan training groups though, with 2 groups running in parallel aiming towards 1k and 60mins respectively. I will be following the 60min training and see if I can get my 60min TT back over 17k. I will have to be pushing the distance work a lot harder to get there, and mix in some focussed interval work.